…at least I hope they will eat it. Hmmm. Perhaps I better cross my fingers on this point. But my kids seem to really like this…so I think yours could too! Sweet. Crunchy. Tangy. Purple. Did I already say Sweet? And Purple? It only has a few ingredients. It is super easy to throw together. And it is super-duper healthy. Did you know about all of the health benefits of Cabbage? Especially Purple/Red Cabbage? 1. Cabbage is an amazing detoxifier due to abundant amounts of Vitamin C, Sulphur, and other minerals that help it to purify the blood and remove toxins (primarily free radicals and uric acid). 2. Cabbage has wonderful anti-cancer properties, due to over 30 different anti-cancer chemicals identified in it. The most beneficial property is due to the high content of anthocyanins, a class of flavonoids that has been linked to cancer protection. 3. Cabbage is known to boost immunity, due to the high levels of Vitamin E which are known to assist in DNA repair and other metabolic processes, along with developing immunity building properties. 4. Juice from the red Cabbage is known to aid in ulcer and digestive healing because of it’s high levels of the amino acid called glutamine. Hopefully, some of those above reasons will encourage you to see if your kids will try this salad! 1. 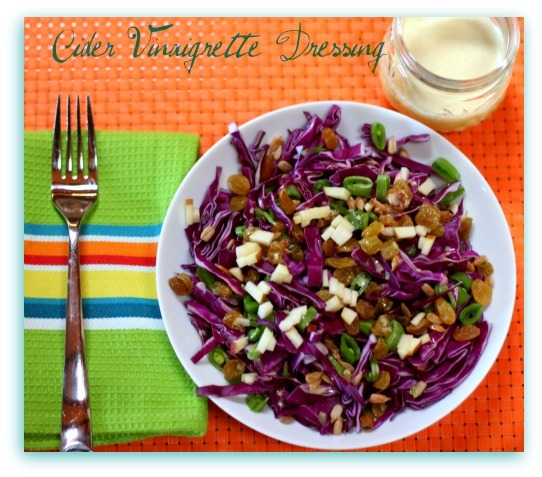 Place sliced Cabbage, Apples, and Cranberries or Raisins in a salad bowl. 2. To blender, add dressing ingredients: Apple Cider Vinegar, Oil, Mayonnaise (or Egg-Free version), Sugar, and Sea Salt. Blend dressing until smooth. 3. Pour dressing over Cabbage mixture. Let sit for at least an hour, or up to overnight, to infuse flavors. This actually gets better the longer it sits. Enjoy. Okay, now tell me….do you think YOUR kids (or whoever your picky eater might be) would like this? Oh this looks amazing! The colors alone are amazing! I LOVE cabbage and am always trying to find ways to get my oldest to eat it. He’s getting better about it, but I think I need to try this one on him! It sounds amazingly delicious! Sarena, you will have to report back to let me know if you were able to get him to try it! 🙂 I think the colors are one of the main reasons my kiddos like this! I want some now, please. Beautiful salad! I’ve been making all kinds of slaws this winter and I needed some new things to throw into the mix. You’d be proud of me for using lots of apple cider vinegar for my dressings too. Wendy, I AM so proud of you for using all of that ACV now!! 🙂 We go through tons of cabbage around here too and we add it to so many different dishes. I want to start growing it in the garden since we eat so much of it. You know me, Alisa! I get that ACV in whenever I can! And, I think you will like this one!! Sounds so lovely, and looks so pretty, win-win indeed! Tried it….and I say it is a winner! 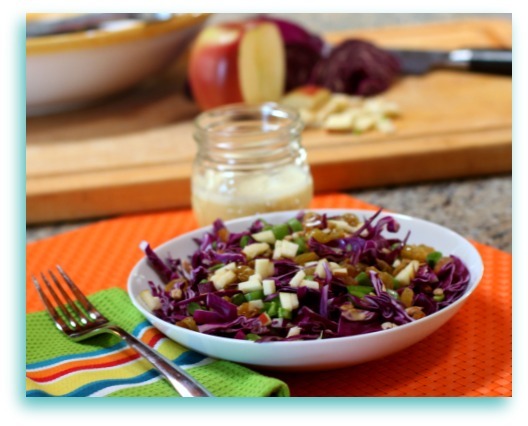 Mmm…nothing like some crunchy cabbage salad to give your organs a big hug! 🙂 I am such a cabbage fan. I need to start a board for my obsession on Pinterest! Hallie, I love that…giving your organs a big hug! I love cabbage too. We add it to all kinds of things around here: tacos, sandwiches, salads, pastas… my kids really like it. I always love your creations! kids shmids. I’ll take it all for myself! Ha – I agree with Cara – I want this myself!!! Love these flavor combos and so very pretty! Veggies are naturally gluten-free! This looks like a super recipe to try this weekend! Thanks for the healthy tips! Making this right now only with green cabbage since I happened to have a half in the fridge that needed to be used up. Quick question…it looks like theres something green in the picture like scallions or green onions but I didn’t see it mentioned in the recipe? Either way it looks great! Hi Sharon! Sorry I am just getting to your question, but was offline yesterday! The green things in the picture are diced sugar snap peas that I needed to use up in the fridge. I usually do not make it with them (which is why it was not mentioned in the recipe), but it did add a fun flavor and crunch to the salad. This is one of those things that you can get creative with and add whatever you please! 🙂 Hope it turned out well for you and that you enjoyed it!! Thanks! I made it last night and thought it was great! Creamy and sweet and crunchy! Couldnt get my kids to try it though as they have already declared that they do not like Cole slaw. I used green cabbage so it did look more like traditional cole slaw…next time I’ll try to trick them with the purple! It makes a ton, too! I’ll be snacking on this all week! Not sure about my little ones eating it, but I certainly will. It looks awesome. I love simple sides like this and I love coleslaw-type salads. Thanks for the recipe! Made this today. So yummy! I love the crunchy and the sweet and tangy. My girls were absolutely willing to try the “purple salad.” No complaints! 🙂 Always looking for great recipes that my kids are willing to try AND provide them with such healthful ingredients. Thanks for the recipe!